When it opened in downtown Columbus in late 2013, Wolf’s Ridge Brewing quickly became noted not only as one of the city’s most accomplished breweries, but also one of its best dining spots. In the years since it opened, it has racked up awards for its beer and food, and expanded the brewery, added a taproom and opened an on-site event space. The gorgeous main dining room features restored wooden floors, exposed brick and a living wall: a large section of lush live greenery that provides a touch of color. The open floor plan can be arranged to accommodate intimate two-tops and large communal tables. There’s a bar toward the back, and a portion of the brewery is viewable through glass walls. The restaurant serves lunch, dinner and weekend brunch. Chef Seth Lassak and his team have crafted a modern American menu that focuses on creative presentations and the use of local ingredients. 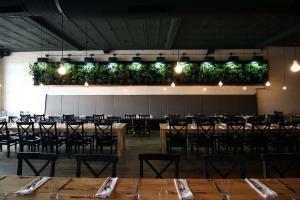 The menu shifts quarterly to accommodate new flavors and seasonal offerings. Guests will discover old favorites and new creations on the menu. 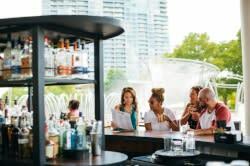 For instance, you can reserve a seat at lunch to enjoy BBQ pork rinds, charcuterie plates, ale mac and cheese, burgers, Nashville-style hot chicken, fish tacos and more. 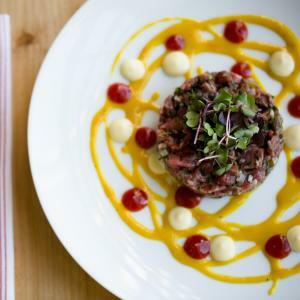 Dinner offers sophisticated twists on comfort fare: venison tartare, pork tenderloin, lamb shanks, sea scallops, roasted quail. Brunch features beautiful dishes like toad in a hole, eggs Benedict, rich French toast and pork cheek hash. Chef Lassak and his crew often incorporate house beers into their dishes, like bratwurst marinated in Clear Sky cream ale and even breads made from spent grains. 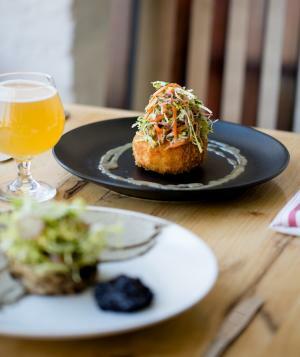 Of course, the house beers also pair perfectly with any dish on their own. 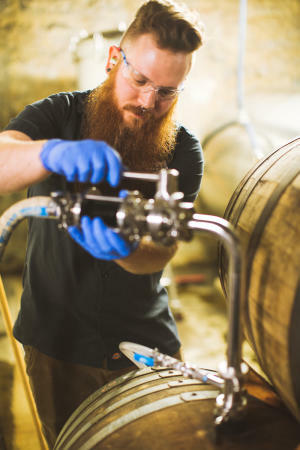 In the lower levels beneath the restaurant, the extensive Wolf’s Ridge brewery operations are run by head brewer Chris Davison. He and his team produce a diverse roster of beers that cover nearly every style, from classic lagers to robust stouts, hoppy IPAs to tart sour beers. First-time visitors should start with the clean and lightly sweet Clear Sky cream ale, the hoppy-but-easily-drinkable Driftwood session IPA, the Buchenrauch smoked lager, and rich Dire Wolf imperial stout. Davison has brought home multiple medals for this beers from the San Diego International Beer Competition, Alltech Commonwealth Cup, Indiana Brewer’s Cup and other events. 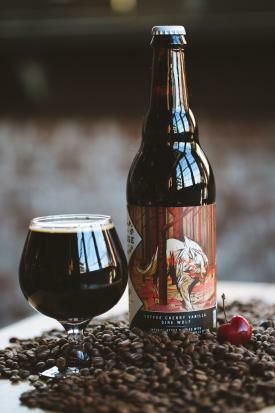 In addition to the beers on tap at the restaurant and in the taproom, Wolf’s Ridge’s standard offerings are bottled and sold all across the city. Davison also hosts special bottle releases several times a year; die-hard beer fans will line up down Hickory Street outside the brewery to snag rarities like their Terra du Sauvage sours; variations of Dire Wolf infused with coffee, rum, coconut, or peppers; and All the Breakfast, an imperial cream ale infused with cacao, maple syrup, coffee and orange peel. Roughly two years after opening, Wolf’s Ridge expanded with the addition of a taproom at the rear of their building. The previously unused space was renovated to add windows, providing a bright space to enjoy 20 taps of beer, live music, board games, and a smaller food menu crafted especially for the taproom. In late 2018, Wolf’s Ridge expanded its kitchen and opened an event space at the front of its building called The Hickory Room. The room serves as a private, rentable space, and also hosts special events like beer dinners, tastings, and seasonal releases. Whether you’re looking for a hearty brunch or a quiet dinner, the latest beer release or a couple pints with friends, Wolf’s Ridge Brewing is a destination that should appeal to everyone.